Microsoft's Surface 2 and Nokia's Lumia 2520 (pictured at top) may have similar displays on paper, but a test of both tablets found Nokia to be the clear winner on screen quality. According to DisplayMate, the Lumia 2520's 1080p panel has the brightest and most readable display of any tablet that the firm has tested. The Lumia 2520 is 74 percent brighter than the Surface 2, and 52 percent brighter than Apple's iPad Air. 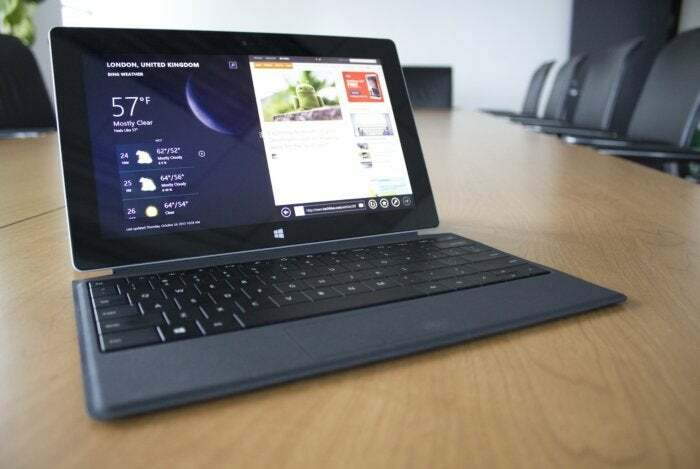 DisplayMate also praised the Lumia 2520's low reflectance and high contrast rating, essentially confirming Nokia's own claims about the outdoor readability of its Windows RT tablet. 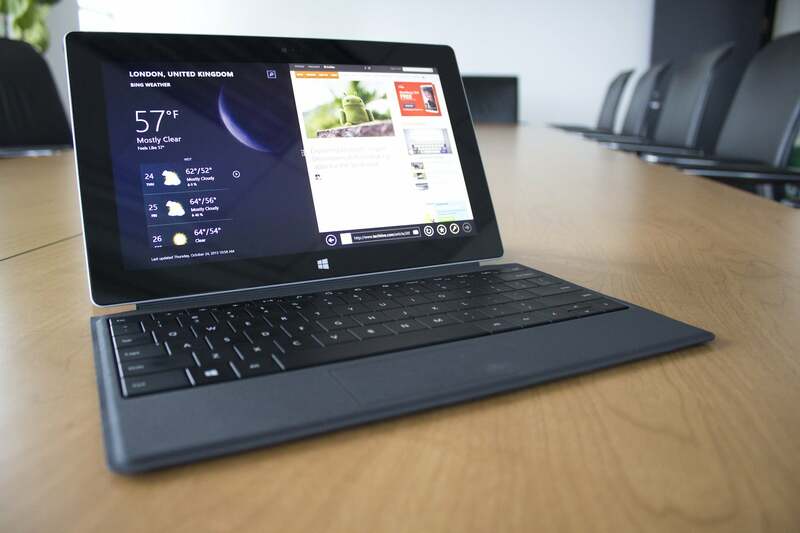 The results for Microsoft's Surface 2 are more surprising. Last year, Microsoft made a big to-do about the high contrast and low reflectance of the Surface RT, arguing that these qualities were more important than a high-resolution display. But with the bump in resolution from 1366-by-768 to full 1080p in the Surface 2, the display actually takes a step backwards in terms of brightness, contrast ratio, high ambient light performance and specular reflectance. In other words, Microsoft made a few sacrifices to achieve a higher screen resolution in the Surface 2. 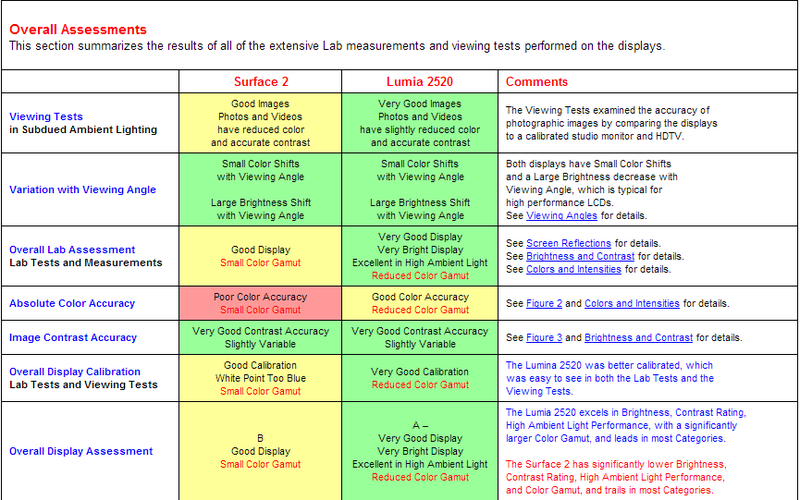 On the (figurative) bright side, the Surface 2 does get a 5 percent boost in color gamut over its predecessor, from 57 percent to 63 percent. Still, that's inferior to the 75 percent gamut on Nokia's Lumia 2520, and much worse than the full color gamut found on Apple's iPad Air and Amazon's Kindle Fire HDX 8.9. Colors outside of the gamut won't be produced as accurately, though the difference may be hard to notice without side-by-side comparisons to other tablets. 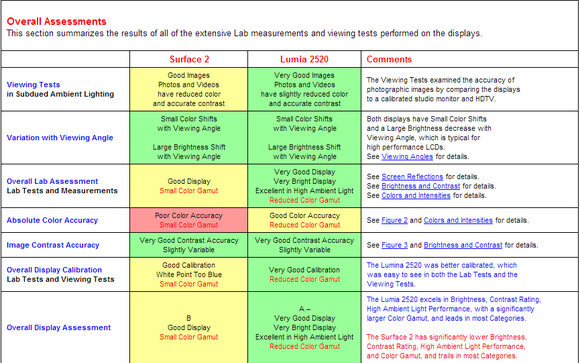 The full DisplayMate report has a ton of nitty-gritty details about the two displays. DisplayMate also made headlines recently by pointing out that Apple's iPad Mini with Retina Display has a narrower color gamut than Amazon's Kindle Fire HDX and Google's Nexus 7 tablets. The firm also claimed that the new iPad Mini was worse with color reproduction than the full-sized iPad Air. While tablet makers once competed on screen resolution alone, we've reached the point where super-high pixel density is the norm. That makes comparisons of contrast and color reproduction all the more interesting, especially as tablets become more useful for productivity tasks such as photo and video editing. When it comes to Windows RT devices, Nokia has won this round. Now all we need are some worthy productivity apps in the Windows Store.